Just like the excellent XT60 connectors only bigger! High quality, genuine XT90 connectors made from high-temp nylon and gold plated spring connectors. Their gold plated spring connectors provide an excellent contact surface, while their tight fit means a solid connection with minimal resistance. The XT90 ensures a solid high-amp connection; perfect for high amp applications up 90A constant, and probably some way beyond - ideal then for heavy lifting hexa and octocopters. They have an ergonimic, easy grip design which also protects against reverse polarity & shorting. Finally they are easy to solder, because of their half-open threaded coupler for up to 10AWG. XT90's have traditionally only been available in yellow, however we now have a supply black ones which really suit the carbon frames. Aside from the colour difference, they are both exactly the same and interchangeable, so you can mix and match. Advice on how to solder your connections. Choosing the right connector: There is a massive array of connectors on the market and they are not universally suitable for all multicopters. In basic terms, a connector is a device used to connect two or more electrical elements in order to allow current to flow from one to the other. In reality this could be achieved without a connector, so this correctly implies that there are other requirements. Technical requirements such as, current rating, resistance, and reliability should principally guide your choice; however personal preference based on ease of use/soldering, past experience and recommendations is usually the deciding factor. There are 2 main kinds of connectors, those that have the electrical contacts covered, or housed, and those that are exposed. Housed connectors include connectors like Deans and exposed are like bullets. 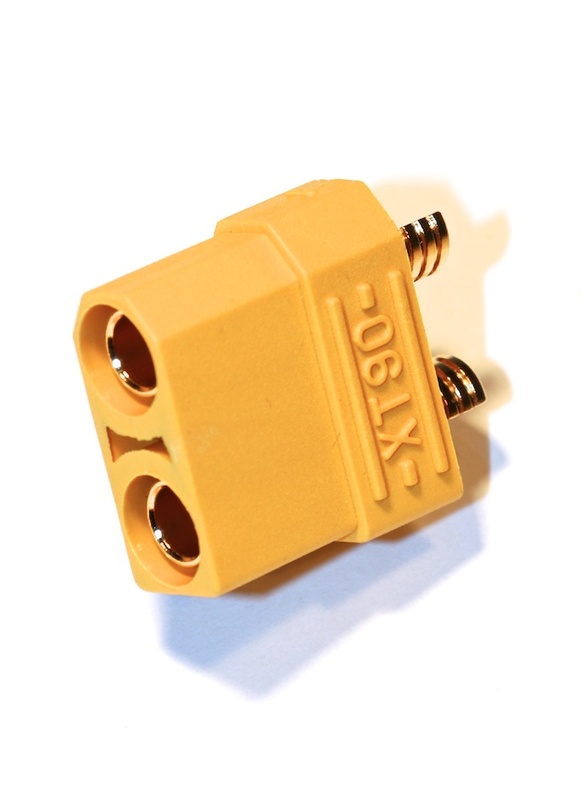 While housed connectors are marginally heavier, they are safer as their shielding helps to prevent electrical shorts. Bare connectors can be made safer by applying heat shrink. Another advantage of housed connectors is that they typically prevent you mixing up the polarities and shorting the battery. Connector choice is most critical for high current applications, it's best to err on the side of caution when it comes to current rating. Always remember that there is no problem with using a larger connector than is required, apart from added weight and cost. Generally speaking small JST connectors are used to connect auxiliaries (BECs, LEDs etc), while 3.5mm bullets are often employed to connect ESCs to Motors. Finally, Deans, EC3s, XT60s, HXT 3.5mm are generally used for mid current applications, while 5.5mm bullets, EC5s and XT90s for high current applications.